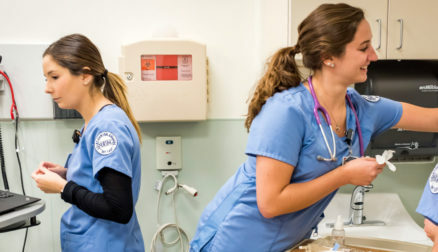 Every Tuesday and Thursday at 6:45 a.m., Dartmouth-Hitchcock Medical Center (DHMC), Dartmouth-Hitchcock’s Lebanon, N.H., hospital, is awash in a sea of blue scrubs as more than 100 Colby-Sawyer nursing students arrive and disperse to their assigned patient care units. They never know quite what their long days will bring. Our alumni have tucked a wealth of wisdom into the stories written about them over the years. With Commencement on May 11 approaching faster than can be believed, we mined some nuggets of advice from our archives that may apply to anyone, but especially to the Class of 2019 as they prepare to graduate and put their education into action. 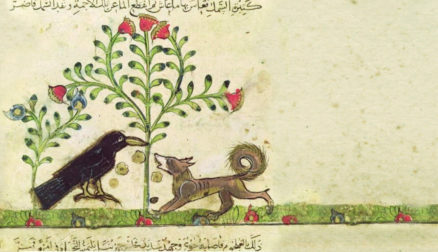 “The 19th century,” writes English art critic John Berger in Why Look at Animals, “saw the beginning of a process … by which every tradition which has previously mediated between man and nature was broken.” Berger goes on to explain that before urbanization and industrialization, animals circled mankind, sharing streets and wild spaces with humans. Last semester, Professor of Humanities Tom Kealy and his First Year Symposium (FYS), “Animals in Culture and Nature,” attempted to repair this rupture by placing animals at the center of their academic inquiry. Ioannis Bechlivanos ’21 is originally from Larissa, the capital city of Greece’s Thessaly region. But Colby-Sawyer has become a second home for him as he pursues a B.S. in exercise science. 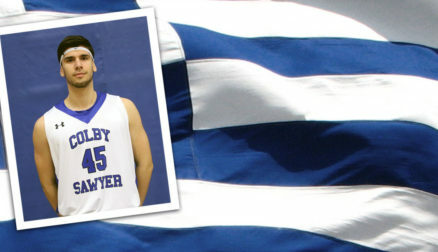 Studying at Colby-Sawyer has provided him opportunities not available back home, such as the chance to play basketball at the college-level. 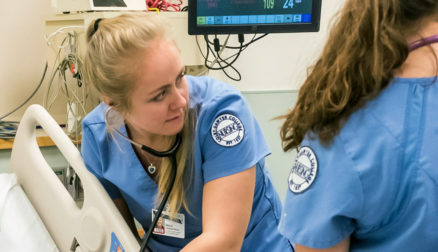 Imani Gaetjens-Oleson ’20 has always wanted to be a nurse. And she knew as early as second grade that she wanted to help deliver babies. By applying to Colby-Sawyer’s elite nursing program, she put in motion the steps to realize that dream. 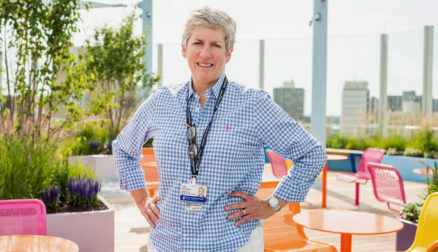 The powerful partnership between Dartmouth-Hitchcock (D-H) and Colby-Sawyer has given her firsthand clinical experience, including the chance to spend weeks working on Dartmouth-Hitchcock Medical Center’s prestigious birthing pavilion. By the end of her OB/GYN rotation, she had witnessed births and confirmed that her childhood dream was still what she wants to pursue. 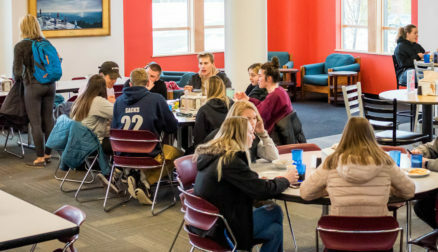 Dining services staff care about students’ preferences and needs. Whether it’s “waffles all day” or “more Thai and Vietnamese dishes,” they are always willing to listen to suggestions from students like “Rice Lover” and you! 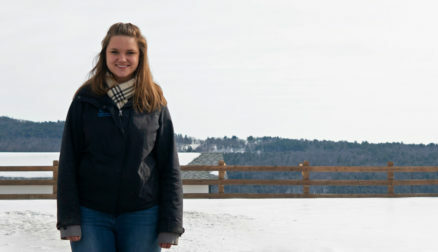 The field of psychology only recently recognized horseback riding’s therapeutic power, but it’s something longtime horse rider Shannon Giguere '19 of Shrewsbury, Mass., has instinctively known. During an internship with Full Circle Farm Therapeutic Horsemanship (FCFTH), an equine assisted activities and therapies program located in Newport, N.H., Giguere helps deliver the healing power of horseback riding to a wide array of people with varied abilities and diverse needs, from veterans to 4-H Club members. Horseback riding improves participants physical health through improved motor skills and muscle control as well as their socio-emotional health by teaching trust, confidence and independence. 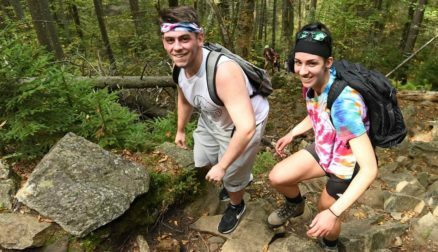 As a sophomore in a class with Professor of Natural and Environmental Sciences Nick Baer, environmental science major Taylor Spadafora ’20 loved how enthusiastic he was about the material. 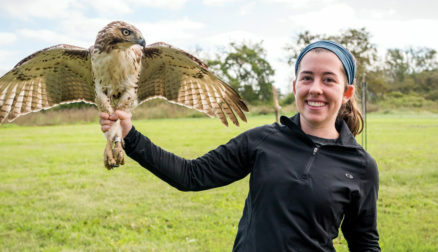 He became her mentor, and at the end of the year when he offered her an internship working with him to research flat flies and avian pathogens as part of the Cape May Raptor Banding Project in New Jersey, she accepted. Last February, Kevin Richardson ’18 presented to the Board of Trustees as president of the Student Government Association (SGA). The student report is a standard feature of the trustees’ meetings, but what happened next was anything but ordinary. Trustee Tony Librot ’94, CFO of the real estate investment and management company AAM 15 Management in Burlington, Mass., had just accepted an analyst’s resignation. Librot, with his business acumen, sensed an opportunity and asked Richardson to send him a resume. Richardson was hired 10 days later. 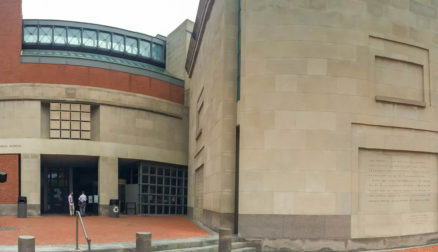 There was palpable tension on Monday, Aug. 14, 2017, as I started my third week of work at the Jack, Joseph and Morton Mandel Center for Advanced Holocaust Studies at the United States Holocaust Memorial Museum in Washington, D.C.
Communication studies major Alicia Lacasse ’19 helped capture some of love’s most magical moments while interning at Loon Weddings last semester. 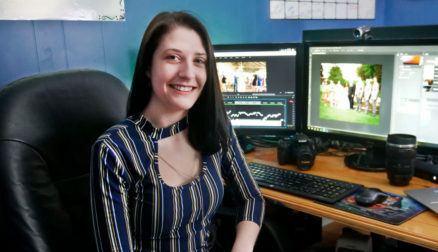 Working behind the scenes to get the perfect shots in front of her lens, Lacasse gained professional experience while preserving time so that couples could relive their special day. 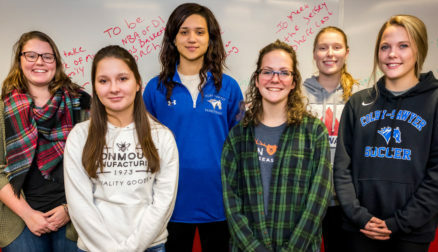 Colby-Sawyer College has been selected to join the BOLD Women’s Leadership Network, a highly selective national program of female scholars, and was awarded a three-year, $1.1 million grant for scholarships and transformational campus projects. It’s become a routine activity, but donating blood is a powerful reminder of humanity’s interdependent nature. The word “blood” even serves as shorthand for close relationships. Blood donors, of course, are vital to the crucial exchange, but so are the behind-the-scenes people who drive individuals to give. 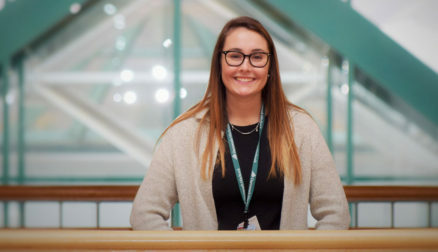 As a relations intern for the Blood Donor Program at Dartmouth Hitchcock Medical Center (DHMC), sociology major Talia Hardy ’20 of Litchfield, N.H., established connections with community partners to encourage blood donation. In doing so, Hardy learned that relationships are at the heart of hospitals. Ayla Cordell ’19, a sociology major from West Chesterfield, N.H., interned in D.C. this summer with New Hampshire’s U.S. Maggie Hassan. 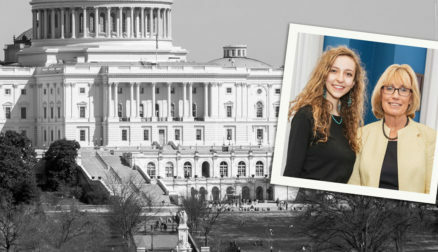 As a legislative intern, Cordell attended legislative hearings and briefings, conducted tours of the Capitol and served as an interface between the senator and her constituents. 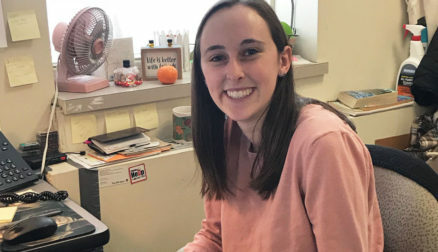 After pouring all her passion for social work into her internship with the Division for Children, Youth and Families (DCYF) in Claremont, N.H., child development major Caroline Wall ’19 learned to have confidence in herself and her goal to be an assessment worker for the agency that manages protective programs on behalf of some of the state’s most vulnerable citizens. Six months after graduating with her degree in sociology, Kavyaa Rizal ’17 returned home to Nepal to contribute to the country’s social development. She landed a job as a program officer for Women Development Advocacy Center (WDAC), a nonprofit dedicated to helping young women secure sustainable livelihoods. The job means she now spends her time putting the sociology theory she learned at Colby-Sawyer into practice. Her most recent accomplishment? Raising nearly $6,000 in one month to support education in an impoverished area of Nepal. 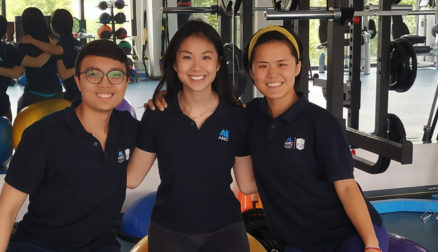 This summer, exercise science major Katherine Nguyen ’19 interned at the American Medical Center Shanghai (AMC). The AMC was the first Western surgery center to specialize in sports medicine and orthopedics in China. Nguyen, from Lowell, Mass., is on Colby-Sawyer’s pre-physical therapy track and wanted to learn more about the industry by observing China’s integration of Western medicine into its health care practices. After learning through a DNA test that she was not 100 percent Vietnamese as she believed but in fact had Chinese ancestors, Nguyen also wanted to experience the country’s culture. 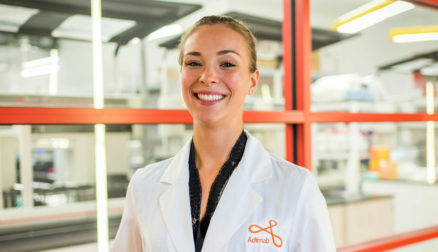 Her internship showed her both where she came from and where she’s heading for a career. At the back of Boston Children’s Hospital, a wall of windows looks onto a 2.5-acre pit where the 11-story Hale Family Clinical Building will open in fall 2021. The tower is the centerpiece of a $1.25 billion expansion and renewal project that includes improvements to the Longwood Campus; a pedestrian bridge between the parking garage and main building; and a new Brookline clinic. It’s all taking shape under the leadership of Lisa Hogarty ’81, senior vice president of real estate planning and development at the hospital and a trustee at Colby-Sawyer who joined the board in 2016. It’s tradition. 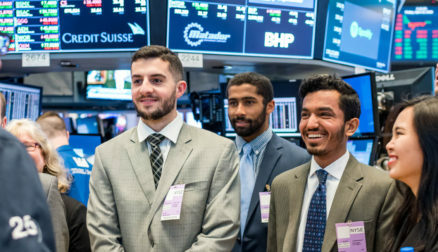 Each year, students in the Investment Management class visit New York City to tour financial institutions and meet with industry experts. 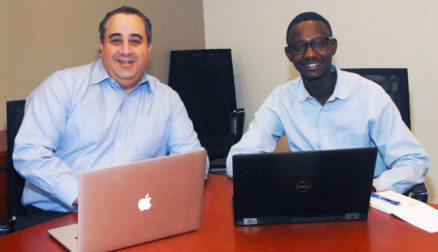 This April brought the same trip but with an exciting spin: Pro­fessor of Business Administration Jody Murphy planned an itinerary that gave seven other classmates and me unprecedented access to the inner workings of the world’s financial capital. Here are my highlights, though I found every part of the trip enlightening. Seasons help mark the passing of a year, and Colby-Sawyer’s lucky to be nestled in the middle of New England where four distinct seasons are on permanent rotation. When nursing major Nate Feleke ’19 graduated from his small boarding school in Maine and came to Colby-Sawyer College, he was guided by a group of student leaders dedicated to helping him make the most of his college experience. Those students were his resident assistants (RAs) in Lawson Hall, and they inspired him to pay it forward. A love of sports usually begins in a fan’s hometown parks, streets and playgrounds where they learn to play the game, and then they learn to love the teams that represent their state and region. There’s a direct link between home team loyalty and hometown pride, and it is embodied by sport management major Will Hyland ’19. After the Big Dig buried Boston’s interstate highway, the city put new surface space to good use and created a 1.5-mile ribbon of parks known as the Rose Kennedy Greenway. 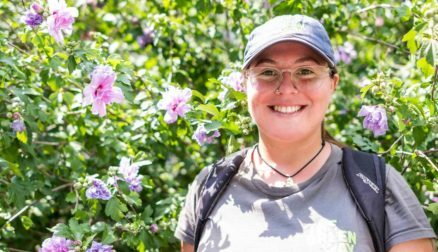 Environmental studies major Nicole Semeraro ’18, who interned at the nonprofit and took a position there after graduation, cultivates and maintains the plants that make Boston beautiful. The nervous system is one of the most complex structures in the human body, and it requires a high level of skill and coordination from the specialists who care for patients with neurological disorders. 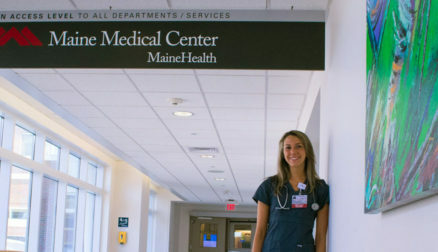 This summer, nursing major Julia Martin ’19 learned exactly what that means during an internship at Maine’s largest hospital. The art of cinema is a bit like an extended magic trick. Both depend upon a suspension of disbelief and a carefully crafted performance to make the pretend seem real. But like any magic show, a lot of work needs to happen behind the scenes to bring the illusion to life. As a location manager, Colby Picanso ’11 is one of the first people to see a script. It’s his job to find and manage the locations that become the foundation of movie magic. 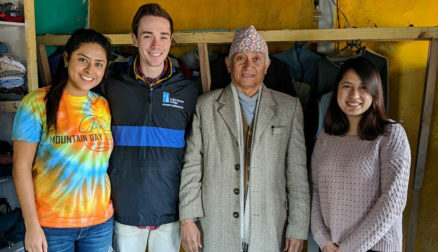 Thanks to the efforts of three Colby-Sawyer students, farmers in the rural village of Phidim in eastern Nepal have a thrift store where they can find affordable winter clothes. The Ranch at Rock Creek 20 miles outside Philipsburg, Mont., is the world’s first Forbes Travel Guide five-star guest ranch. By default, that makes business major Shea Shaugnessy ’11 the manager of the only Forbes five-star activities department in the world. 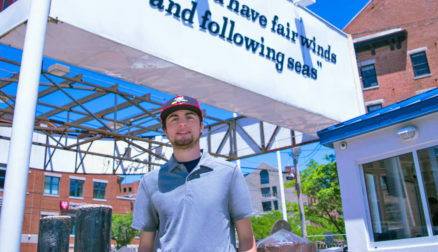 It’s a position that combines the business education he gained at Colby-Sawyer with the outdoor and hospitality skills he learned growing up in Vermont. 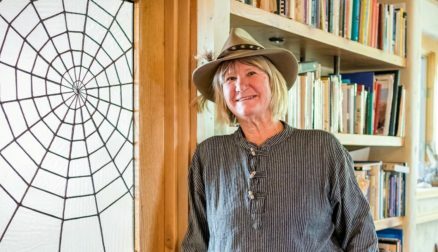 In the Bozeman, Mont., home of Joan Weed Montagne ’67, there’s a wooden door with a large glass panel on which a spider web spirals out to fill almost the entire space. Joan’s father, famed furniture maker Walker Weed, built the door in memory of her mother, Hazel, a talented weaver, but it could well represent Joan’s own expansive life. She inherited her parents’ trait of embracing different cultures, and since her childhood in Gilford, N.H., she’s lived a year each in Norway and Japan. 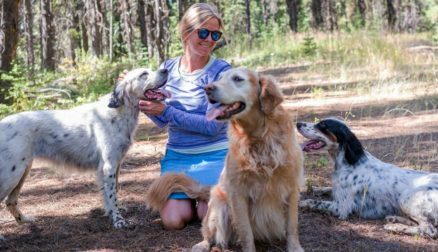 For the past 20 years, she’s focused on BioRegions International, the nonprofit she founded with her husband, Cliff, and its work connecting rural Mongolia with the Greater Yellowstone Ecosystem. Graphic design is an art form, but it’s also a creative service that fulfills a need for customers. 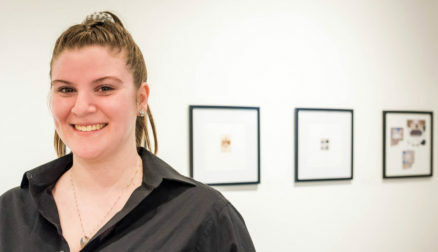 This spring, graphic design major Gabrie Libby ’18 of Gorham, Maine, experienced the joy of delivering a final product to clients while interning with two local organizations. She discovered that delivering a meaningful product is the greatest reward. 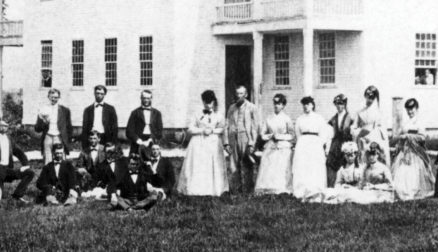 This year, the educational institution now known as Colby-Sawyer College will celebrate the 180th anni­versary of welcoming its first students. While founded as New London Academy and officially estab­lished through a charter from the state of New Hamp­shire on July 4, 1837, the first class of 26 girls and a 10-year-old boy didn’t matriculate until May 1838. For more than a quarter of a century, Carrie and I were a part of the Colby-Sawyer community as college librarian and biology professor, respectively. We were attuned to the dynamic pulse of its daily life. Since our retirements, we live on an island off the coast of Maine, where life unfolds according to different rhythms. It was with some surprise, then, that I encountered a correspondence between these physically distant and seemingly disparate worlds. Business majors are expert marketers. They learn how to discover a product’s selling point and convince people to buy it. Most important, business majors learn how to market themselves. 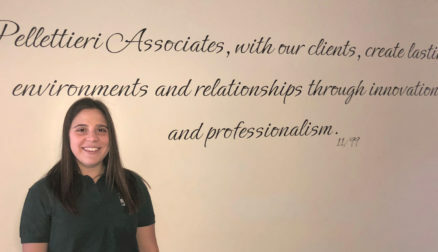 Lauren Blanchard ’18, who worked as a marketing and management intern at Pellettieri Associates, leveraged professional development skills she learned at Colby-Sawyer to land a job offer from her internship site. 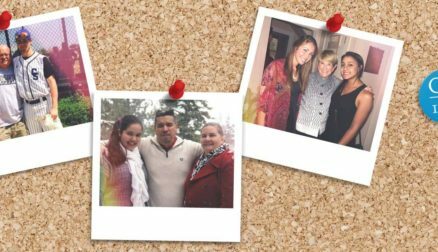 For every student and alumni success story, there is a cast of supporting characters: the parents and families who help their children through life’s changes and stages. 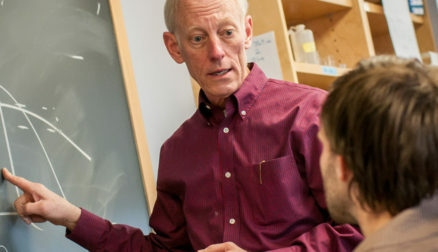 They play a major role in making a Colby-Sawyer education possible for those they love. 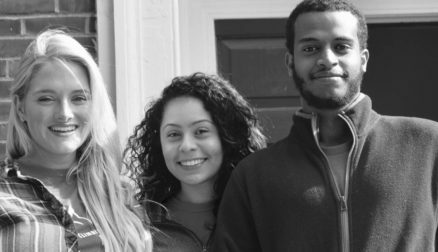 From afar, and mostly behind the scenes, they’re essential to the success of Colby-Sawyer students and the future of the college. Though their stories and relationships with the school vary, they all have one thing in common: pride for their children-turned-college students.